The flavors of early summer raspberries mingle well with the floral overtones of vanilla in this delicious tart. 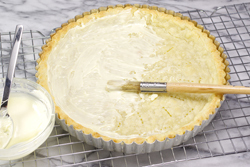 The crust features a cream cheese base that adds just a hint of tang. It’s a crust that’s nearly foolproof to make. The baked crust is filled with an easy vanilla pastry cream and topped with fresh red raspberries glazed with shiny layer of seedless raspberry jam. It’s a spectacular dessert that’s deceptively easy to make. 4a. 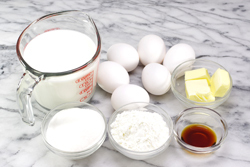 Form the rough dough into a ball using your hands and with a light touch. 4. Remove the rough dough crumbs from the work bowl and form into a ball using your hands and a light touch. 5. 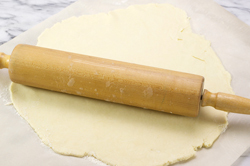 Flatten the dough ball into a disk and roll into a 12-inch disk about 1/4-inch in thickness. Transfer the crust to the tart pan and pat into place. Trim the crust even with the top edge of the rim. 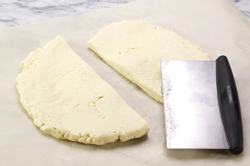 Chill the crust dough in the pan for an hour. 6. Preheat the oven to 400°F. 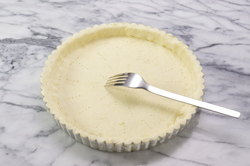 With a fork, prick the crust to provide steam holes for the baking crust. Blind bake the crust by lining the inside with a piece of parchment paper and placing pie weights or dried beans inside to weigh down the crust as it bakes. 7. Bake the crust for 10-12 minutes. During this time, the crust will assume its final shape. Remove the crust from the oven, and carefully remove the liner and pie weights. Return the crust to the oven for another 5 minutes. This second session in the oven will further bake the bottom of the crust to flaky perfection. 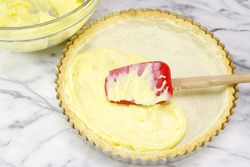 The edges of the tart crust will just begin to show a golden color. 8. Allow the baked crust to cool completely. “Paint” the inside of the crust with a thin layer of melted white chocolate. Chill until ready to fill. 8. Warm the milk to just shy of a boil either in a small saucepan or in the microwave. 9. 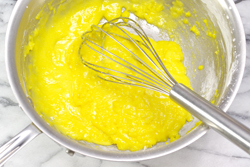 In a medium saucepan, whisk together the egg yolks, sugar and cornstarch. 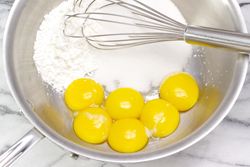 Whisking continuously, gradually drizzle in the hot milk (take care to disperse the heat evenly and quickly in order to avoid any curdling of the egg yolks). 10. Place the saucepan over medium heat. 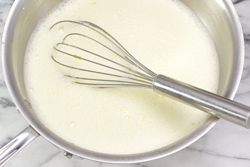 Whisking continuously, allow the mixture to come to a boil and to cook at a boil for an additional minute. 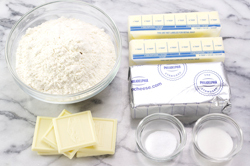 Remove from heat, add the vanilla. 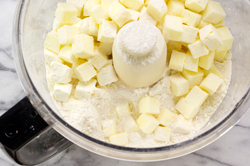 Allow the mixture to cool for about 5 minutes, then add the cubes of butter a few at a time whisking all the while until melted and well incorporated. 11. Cool the custard to room temperature. 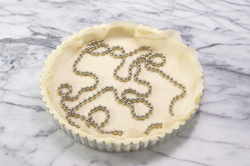 Place a piece of plastic wrap directly on top of the custard to prevent the formation of any “skin.” Once cooled, spoon the custard into the prepared, baked pie shell. 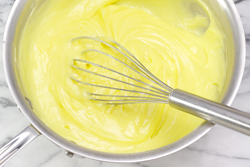 Spread the custard evenly over the crust, but allow the custard to be higher along the rim. This will help keep any juices contained and away from the crust. Refrigerate the pie for 1-2 hours until well-chilled. 12. Wash and air-dry the raspberries, set aside. 13. In a small saucepan, gently warm the seedless raspberry jam until it becomes thin and pourable (do not allow reach a simmer or boil). Add a tablespoon of water to thin the jam to a glaze consistency. 14. 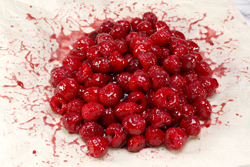 Place the raspberries in the center of a sheet of parchment paper (or wax paper). Pour half the glaze over the mound of raspberries. Lift the paper effectively rolling the raspberries around until the raspberries are coated with the glaze. This method keeps the raspberries from falling apart. 15. Lift and “pour” the coated raspberries on the center of the cooled custard. Immediately chill the tart so that the glaze firms. Chill for 30-60 minutes. 16. 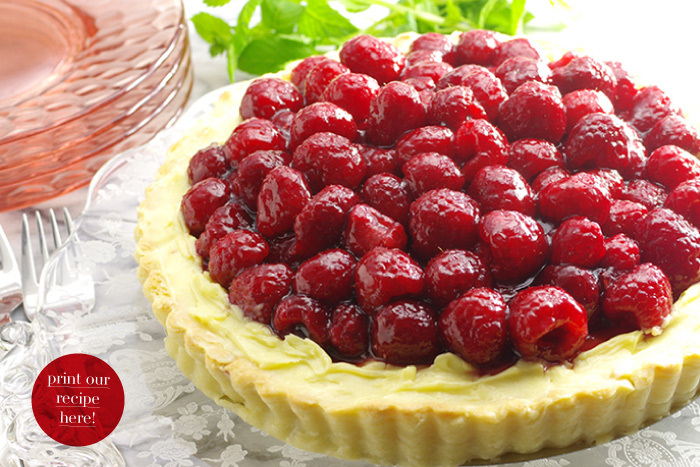 Cut the chilled tart into wedges, serve, and enjoy!